Combine all ingredients and marinade your wings overnight for best flavor. For a quick marinade, 2 hours will also do the trick. Remove wings from marinade. Fry naked wings until done, they will be dark, so don't worry that they are burned, they're not. While the wings are frying, in a small sauce pan, pour marinade in and add 1 tablespoon of orange marmalade. Bring to boil, reduce to simmer and it will thicken. Remove wings from fryer and place on a paper towel. Dip each wing in your reduced sauce, place on a platter and sprinkle with sesame seeds. Place 2 cups of white or brown rice in your rice cooker. To the dry rice, add in Sazon, adobo, green olives, recaito, tomato sauce, salt and gandules. Incorporate all so that rice is coated throughout. Place in 2 cups of chicken stock and make sure the rice is completely covered. Shut the lid, press cook and in 20 minutes you'll have arroz con gandules. Serve with your choice of meat. 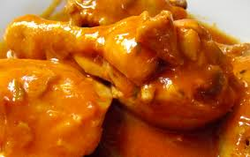 In your slow cooker, drop in chicken, tomato sauce, salt, pepper, recaito, and sazon. Using a tong, make sure the chicken is coated evenly. Take your cup of chicken stock and combine it with your 1 Tablespoon of flour. Make sure there are no lumps then pour over your chicken. Again, take tongs and make sure chicken is covered throughout. Set your rice cooker to 2 to 4 hours and enjoy the rest of your day! Dinner will be great. Can be served with white rice, arroz con gandules or brown rice. In a skillet, drop your sesame oil, soy sauce, garlic, Old Bay, onions, green peppers and carrots. 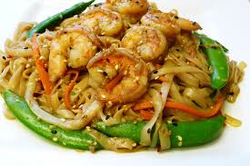 Once your veggies are tender, add in shrimp and sautee until shrimp turns pink and combined with your veggies. The entire cooking process takes 20 minutes and it will be delicious. Serve over noodles, white, or brown rice. Brine your pork chops overnight in the mixture of salt, peppercorns, shallot, bay leaf, garlic, rosemary, brown sugar, vinegar and cold water. The next day, remove from brine, pat dry and allow to sit at room temperature for 15 minutes. You will need a indoor grill pan for this to create hash marks. Spray your grill with cooking spray and place pork chops at the 10 o'clock position for 4 minutes. Next, place your pork chop at the 2 o'clock position for another 4 minutes. Do the same thing on the other side and ensure your pork chop has an internal temperature of 145 degrees. 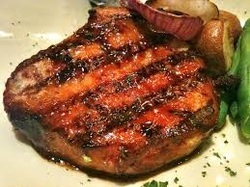 To ensure doneness, chops may be placed in a pan and covered with foil then placed in a 325 degree oven for 10 minutes. Serve with your favorite sides and veggies. Carefully separate Romaine lettuce leaves and soak in salt water. In a skillet, place ground pork and chicken and brown until cooked throughout. The meats will release their own natural juice. Once the ground mixture is done, add in chopped cashews, soy sauce, pineapple juice, garlic, salt, pepper and honey. Incorporate throughout and let simmer for 15 minutes in order for ingredients to marry. Remove lettuce leaves from water, place on paper towels and pat dry. 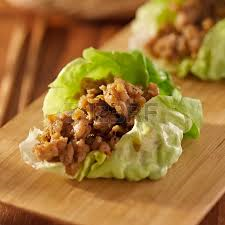 Place a spoonful of the ground meat filling into the middle of your leaf, roll lengthwise so that just enough is showing through top of wrap. Arrange on a platter and you have a tasty and quick appetizer for guests or a midafternoon snack for yourself. 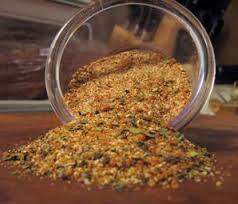 This dry rub can be used on every type of meat and can even be added to your rice for extra flavor. I know, I know! These ingredients look all over the place, but trust me. I've tested this recipe in my own kitchen and it's delicious! The ingredients are best mixed in a food processor, but if you don't have one of those or a hand mixer, you can mix with a whisk but mix vigorously so the oil mixes in all the way. A little secret is this dressing can be used as a marinade for chicken breasts too! Combine all ingredients in a bowl and divide into 6 even sections. Pull one section, roll a meatball, flatten with palm of your hand. Make sure the middle is flatter than the sides for even cooking. 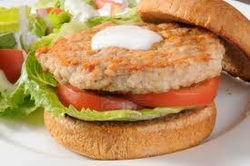 These turkey burgers are healthy and delicious. Top with homemade salad dressing for added flavor.